Nicholas Green was a bright seven year old killed in a senseless shooting incident while vacationing with his family in 1994. His parents, Maggie and Reg Green, wanted to keep his memory alive by recognizing the gifts and talents of children approximately the same age Nicholas was when he died. They donated the savings from their son’s college fund to the award program with the National Association for Gifted Children (NAGC) through 2012. ​WATG continues its commitment to this tradition, administering the selection process and recognizing students at its annual Fall Conference. Award: $250 check, NAGC certificate, one-year NAGC parent membership. We are thrilled to award this year’s Nicholas Green Scholarship to Elizabeth Barganz! 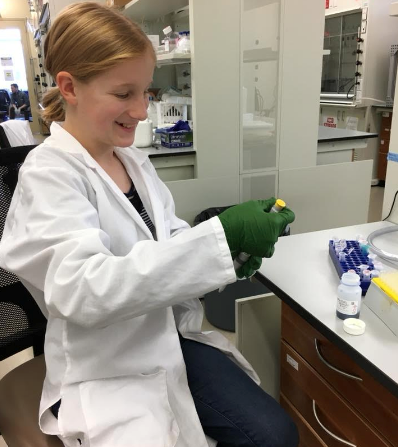 Elizabeth is a 6th grade student from Johnson Creek Middle School who is enthusiastic about researching DNA, genetics and diseases, particularly cancer, Celiac Disease and Sickle Cell Anemia. Elizabeth will be recognized at our WATG conference in November.